The Yarra Valley has been a wine growing district since the 1860s. It is known for its cool climate, premium quality wine. 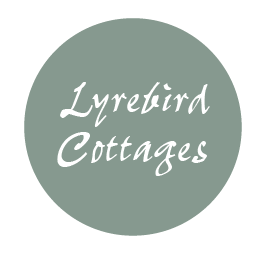 The following companies provide private and group wine tours of the valley and will pick up and return you to Lyrebird Cottages: Group tours have pick up en-route only. Coombe restaurant is located on the former home of Dame Nelly Melba. The restaurant is modern, spacious yet intimate and overlooks the landscaped market-style courtyard and gardens. The view from the conservatory is of the Coombe cottage garden ‘avenue’. The restaurant offers seasonal dishes with Yarra Valley produce and fine food. Try the Cafe and patio area with views of the vineyard for a relaxed and informal space. Stylish Winebar Cafe housed in the award winning building designed by Alan Powell adjacent to Tarrawarra Museum of Modern Art. Magnificent views of Long Gully. A la carte menu updated seasonally. Beautiful views across the Valley to the mountains, stunning architecture. The Greenpoint Brasserie offers a seasonal menu of platters, small tapas style dishes and main meals crafted using the finest produce. Indoor and outdoor dining areas are available with 270 degree views of the Yarra Valley. The Wine Bar Restaurant offers relaxed dining, contemporary style dishes and sweeping views across the Valley in a stunning building. Booking fees are charged on third party websites. A booking fee is not charged on this website.